As a Ph.D. student I've taken my share of methods courses, giving me skills in everything from ethnography to ANOVA. But as important as those things are, I've sensed that there are new research methods emerging thanks to technological advancements and online communities. Our lives are too data-rich and our means of communication are too plentiful to limit ourselves to the same methods for research -- and learning -- that we used just 10 years ago. 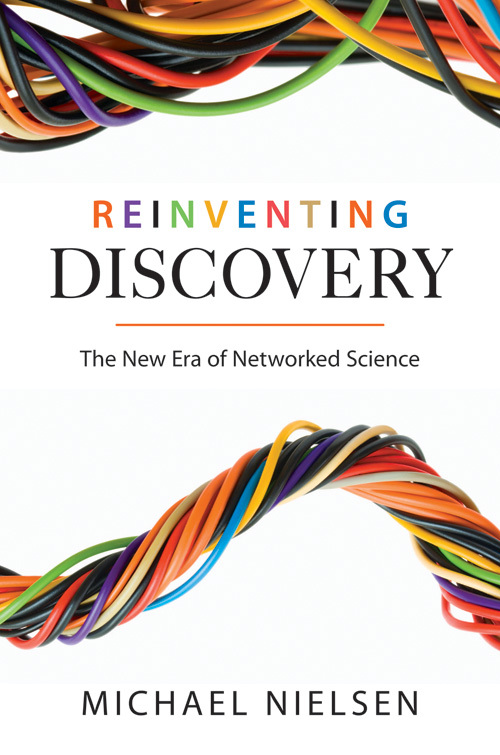 Even though I feel like I live in the thick of this revolution, engaging with teachers and researchers on Google+ and Twiter, I wanted a broader perspective on how researchers use networks to make new discoveries. 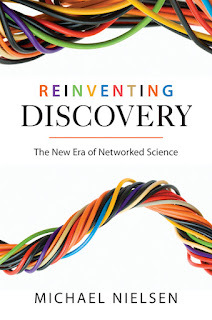 For this I turned to Michael Nielsen's book Reinventing Discovery: The New Era of Networked Science. Although Nielsen is a pioneer in quantum computing, I hoped to find some ideas that I could apply to a social science like education research. If that talk wasn't long enough for you, Neilsen held a longer talk at Google that is worth checking out. As much as I like Neilsen's example of Tim Gowers's Polymath Project, I can't imagine a direct translation to education research. One of the beautiful aspects of mathematics is that it usually doesn't require conducting an experiment, interviewing subjects, sampling a population, or agreeing on a conceptual framework -- the kinds of things that make social science untidy and difficult. Frankly, if solving problems in education were structured like proving mathematical theorems, I think we'd be solving more problems and finding better solutions than we are currently. Neilsen's story about Qwiki hits home for me. For some time now I've imagined creating and maintaining a wiki that essentially translates the contents of the NCTM's Second Handbook of Research on Mathematics Teaching and Learning into knowledge that teachers could access and use. Just like Qwiki, it's easy to get math teachers and educators to agree that this would be a great resource to have. Unfortunately, I'm not sure how a math education wiki like the one I've imagined would avoid Qwiki's fate. Without incentives for experts to contribute and maintain the site, I'd probably spend more time fighting spam than helping teachers. Harnessing Latent Microexpertise -- The project must allow even the narrowest of expertise. A 3rd-year algebra teacher might not have the broad expertise of an experienced math education researcher, but that 3rd year teacher might have small elements of expertise that exceed that of the recognized experts. Designed Serendipity -- The project needs to be easy to follow and encourage participation from a variety of experts. You want problems to be seen by many in the hopes that just a few will think they have a solution they wish to contribute. Conversation Critical Mass -- One person's ideas need to be seen by others so they create more ideas, and the conversation around all the contributions keeps the project going. Amplifying Collective Intelligence -- The project should showcase the fact that collectively we are smarter than any one individual. Those are all great characteristics of any project. But what makes this any different than any traditional, offline project? Nielsen offers several suggestions. Unlike a large group project with clear divisions of labor, technology allows us to divide labor dynamically. Wikipedia certainly would not have grown the way it did if labor had been divided statically between a set of contributors. Also, networked science uses market forces to direct the most attention to the problems of greatest interest. Lastly, contributing to an online project rarely feels like committee work, and participants can more easily ignore poor contributions or disruptive members. The content of the project has to be something that both teachers and researchers can contribute, such as a collection of math tasks, curriculum plans, or perhaps pedagogical techniques. Teachers need to be able to easily use and modify each other's content. (This one's the crux!) When teachers use content, there needs to be a way to collect and submit feedback about the use of that content, and that feedback becomes data that researchers can use not only to improve the content of the site, but to produce new and traditional reports of research. It's that last bullet that's the hardest but most intriguing. There are so many places to get lesson ideas on the internet, but I don't know of any that collect data about the effectiveness of the lesson in a format suitable for research. Khan Academy claims to do this this kind of data collection internally, but KA is a closed project that lacks nearly all of the attributes Nielsen has described in his book. The project I want needs to be an open one, with all of its moving parts exposed and no more owned or identified with a single participant as Jimmy Wales is identified with Wikipedia. If you have ideas for what such a project could/should look like, leave them in the comments!